Since its formation back in 1986, it has gone from strength to strength producing one of the UK’s most popular and successful range of tumble dryers. 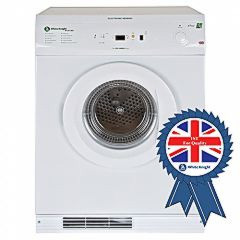 White Knight the tumble dryer brand were proudly awarded first place in the 2011 by Which? Best Buy Survey for Customer Reliability, and are fast becoming one of the UK most trusted brands. With a range of Electric Vented and Condensing dryers in both white and silver, and the newly developed Eco Gas Tumble dryers, we are sure you will find something to suit, at a price that won’t break the bank. Most of White Knight Tumble Dryers are Manufactured in the UK , Yes thats right made in Great Britain. Products are produced, sprayed and assembled in the UK by Crosslee Plc , Europe’s largest independent Tumble Dryer Manufacturers, based in Halifax West Yorkshire. Our Eco Tumble Dryers are the only domestic tumble drying appliances available in the UK which uses gas rather than electricity and which consequently produces over 50% less carbon than a typical electric tumble dryer with more than 60% lower annual running costs.